Senior Research Fellow/ 01 Master's degree in any one of discipline/ Subject; Dairy Chemistry/ Dairy Technology/ Dairy Microbiology/ Food Science and Technology/ Animal Biochemistry/ Animal Biotechnology with 4 years/5 years of Bachelor’s degree. Post Graduate Degree in any one of following discipline/ Subject; Dairy Microbiology/ Food Microbiology/ FSQA/ Agricultural Microbiology / General Microbiology/ Life Sciences with specialization in Microbiology/ Biotechnology/ BioEngineering (Biotechnology) with NET qualification with 2 years of research experience. Post Graduate Degree holders in Dairy Microbiology/ Food Safety and Quality Assurance/ Microbiology/ Biotechnology/ Applied Science with specialization in Microbiology/ Biotechnology. Post Graduate Degree holders in Dairy Microbiology, Food Safety and Quality Assurance/ Microbiology/ Biotechnology/ Applied Science with specialization in Microbiology/ Biotechnology. Post Graduate Degree in any branch of Animal Science/ Dairy Science/ Life Science with NET qualification. OR Graduate Degree in any one of the above discipline/ Subject in Professional Course with NET qualification. Graduation in Science with one-year working experience. DBT BTISnet Scheme under Dr. J.K. Kaushik, PS ABTC NDRI, Karnal. Junior Research Fellow/ 01 Post Graduate Degree in any one of following discipline/ Subject; Bioinformatics/ Computational Biology/ Computer Science & Engineering with NET qualification (supported by master dissertation thesis). Graduate degree in Computer-Applications/ Sciences/ Engineering with at least a CGPA of 6.5 or equivalent percent marks. The candidate should have knowledge of Windows/Linux operating systems, Spreadsheets, SQL, NET or PHP developer tools. Candidates should have completed M.Sc. / M.Tech degree in Bioinformatics/Computational Biology OR Computer Science /Application with specialization in Bioinformatics/ Computational Biology (supported by master thesis or project report) with CGPA of at least 6.5 or equivalent percent marks. Senior Research Fellow/ 02 M.V.Sc/ M.Sc degree in any one of following discipline/ Subject; Veterinary Gynecology and Obstetrics/ Animal Biotechnology/ LPM/ Animal. Postgraduate OR Graduate degree in Computer Science Engineering (CSE)/ Information Technology (IT)/Veterinary Science. Post Graduate degree in Animal Biotechnology/ Biotechnology/ Agriculture Biotechnology. Graduate Degree in Science (Biology/ Chemistry) with one-year working experience. ICAR Young Professional Scheme for University Management System for Post Graduate Education “(MSP)” under Dr. R.R.B. Singh, JD (A), NDRI, Karnal. M.Tech OR B.E/B. Tech in Computer Science/Information Technology /Computer Science & Engineering. M.Sc/ M.Tech in any one of the following disciplines /subject: Dairy Technology/ Dairy Chemistry/Dairy Microbiology/ Dairy Engineering/ Food Technology/ Agricultural Structure & Process Engineering/ Food Engineering/ Food Science and Nutrition/ Food Safety & Quality Assurance/ Livestock Products Technology. Senior Research Fellow/ 01 Post Graduate degree in any one of the following disciplines/ subjects Animal Physiology/Animal Reproduction/ Biochemistry/ Animal Biotechnology / Animal Science with 4 years /5 years of Bachelor's degree. MCA / Master’s degree in IT from a recognized university. OR B. Tech degree in Information Technology. Junior Research Fellow/ 01 Post Graduate Degree in any branch of Dairy Microbiology/ Animal Biochemistry/ Biochemistry/ Animal Biotechnology/ Biotechnology/ Veterinary Biochemistry/ Life Science or any discipline of Life Sciences with NET qualification. Post Graduate Degree in any one of the following disciplines/subjects Animal Physiology /Animal Biotechnology /Animal Biochemistry /Veterinary Sciences/ Life Sciences with NET qualifications. 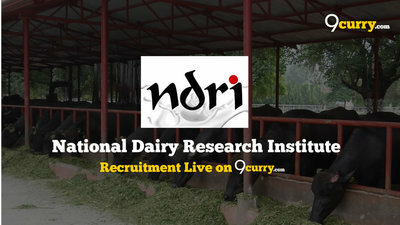 Research Associate/ 01 Ph.D. degree in any one of discipline/ Subject Dairy Technology/ Dairy Engineering/Dairy Microbiology/ Dairy Chemistry/ Food Technology/Dairy Science & Technology. 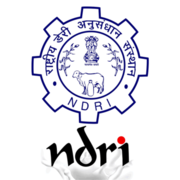 Graduate from a recognized University with minimum 50% marks Dr. D. Sundaresan, NDRI, Auditorium Karnal On 04-04-2019 at 10:00 A.M.
Senior Research Fellow/ 01 Post Graduate degree in any one of the following disciplines/ subjects Dairy Microbiology/ Microbiology/ Biochemistry/ Biotechnology/ Food Science/ Food Technology with 4 years/ 5 years of Bachelor's degree. Candidates having a post-graduate degree in Basic Sciences with 3 years Bachelor's degree and 2 years Master's degree should have the NET qualification.